Payday agencies will get you the payday cash advance you need to bridge the gap until your next payday. The money you need is only a few clicks away. The application only takes a few minutes to complete. You can apply from the safety and convenience of your own home or office. Customer support staff is available to help with any questions and guide you through the online application process. They put an extremely high value of your privacy and right to your confidentiality. They use the best technology to protect you and your personal financial information. If you are at least 19 years of age, have been employed with your current employer for 3 months; have your pay cheque directly deposited into your bank account, have an active phone number you can be reached at, you’re practically approved for a cash advance. 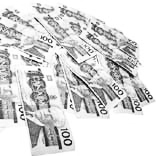 Payday cash advance applications are accepted all over Canada including British Columbia, Alberta, Newfoundland and so forth. Payday cash advance service is a short-term designed to meet your emergency financial needs. Payday advances are also perfect for those times when you need a little extra cash for unexpected bills or special occasions. Average fee for a cash advance is $10.00 for every $100.00 borrowed per week. For example, a payday cash advance in the amount of $300.00 will have a payback amount of $330.00 in a week time. Pay day advances are generally paid back on your next payday. First-time borrowers of payday advances can request up to $300.00, and existing customers can get a cash advance up to $1000.00. How Do Payday Cash Advance Work? You fill out an online payday cash advance application. Once your payday application is approved, an Interact Email money transfer or money wire will be send into your bank account. When payday cash advances are due, the money is debited directly from your checking account on your due date. A customer’s page will be created for you with a personal login that will enable you to update any of your information at any time you choose. It will also enable you to reapply for another payday cash advance in seconds without having to go through the entire application process again. Pay day cash advance don’t have to be laborious application processes with waiting periods and faxes. They appreciate, that you don’t want to wait around for your cash to arrive. They make it their business to get it to you immediately. The staff is knowledgeable and always willing to help with a payday cash advance services, one that can put cash in your account in as little as half an hour or less. Borrowing has really never been easier. The payday cash advance application takes no more than ten minutes to fill out. There is no asking of many questions either – if this is your time of need, for whatever reason, they just want to make sure you get the cash advance you need to take care of whatever financial obligation has arisen. When to use a payday loan? With the cost of living rising for most Canadians, having different credit options is essential. Payday loans are a short-term source of credit that should be used for unexpected emergencies and other urgent needs. Since 2002, Payday loan customers in Canada have relied on Mr. Payday when they need fast cash. If you’re in that situation then you have gone to the right place. The fax payday loan application beats every other online cash advance company. You can open a payday loan account online and they can have cash in your account in 30 minutes.